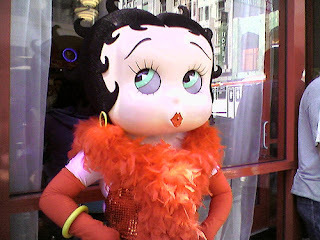 -- Long before Marilyn and Madonna, Betty boop-boop-a-dooped and wriggled her way into hearts worldwide with her unique mix of wide-eyed innocence and powerful cartoon sensuality. This collection lovely restores the Betty Boop comic strips back to their original glory, in Betty's original Sunday adventures as they appeared in the funny pages of daily newspapers in the 1930s, capturing all the cheeky fun embodied by the character. • Betty Boop Paper Dolls -- Dress Betty as a cheerleader, pirate, doctor, hula girl, geisha, mermaid, flapper, and a host of other colorful personalities. • Betty Boop Coloring Book -- 62 vintage images of Betty come from the King Features archive, and they've never before appeared in a coloring book.